Windows systems… I’m not particularly fond of them anymore. I do believe however that the introduction of UAC, while not perfect1, was a step in the right direction. We’re all familiar with UAC by now; introduced in Windows Vista and got better by newer versions. While the technical details are complex, the basic concept is simple enough. Microsoft realized that no matter how much they empathize on Principle of least privilege and advise against using administrator accounts for everyday tasks2, almost all users still do so anyway. On top of that, programmers not following any guidelines, use any location they deem to be fit for their application’s settings. A solution was needed. One that would not break compatibility with older programs, while giving programmers time to adjust to the new security model. It was also needed to give the sensation of “Administrator privilege” to those users who are so damn eager to have it all the time. So thanks to the windows users and programmers, we ended up with an overly complicated solution for an imaginary problem3. From the very start, the new model managed to get a bad reputation. It made the user experience more painful as it would constantly interrupted and annoyed users by the so called “UAC prompt”. While it’s gotten considerably better over time, the bad reputation somehow stuck and now a lot of users still disable UAC as soon as they install Windows. In return, Microsoft made it harder to truly disable UAC in recent versions of Windows (Windows 8+) and even tried to deny access to some apps (mainly Metro apps) if UAC is disabled; Which again, users found their ways around these limits. The principle behind UAC, is to always run programs as a standard user and evaluates the privilege if the application needs it. In this model, the main difference between an administrator account and a standard user account is that the UAC prompt would not ask for an administrator password in the former4. To keep compatibility with older programs, UAC virtualization is introduced. It provides legacy programs with virtualized read/write access to the otherwise restricted system resources. To also encourage programmers to update their codes, UAC virtualization is designed in a way to be disabled if a program is not deemed “legacy”. 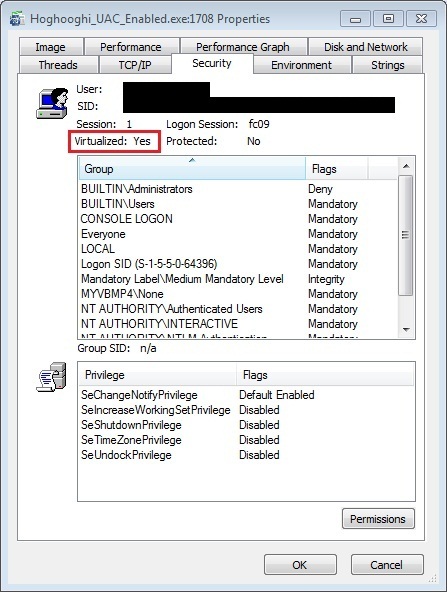 How does Windows decide to enable UAC virtualization for a program you ask? Good question! When virtualization is activated for a program, instead of giving an access denied error, writing (and subsequent readings) to the important system folders and registry keys will be virtualized for that application. On top of all of these, Windows also uses heuristic analysis to identify old setup files and request administrator privilege for them to be correctly installed. Like most other areas, Lazy Programmers Association has a strict guideline for approaching UAC, ensuring full compatibility. Recently i was in need of installing an application for a client. After doing so, i notice the program mandates administrator privilege for execution. Neither the program nor the client was in need of full administrator access to do their job and yet one of them was not complying. The only thing that this program needs to do, is to generate some output files. And As it turned out, it does so in the same location as the it’s executable (in Program Files). I refused to accept this and decided to enable the otherwise deliberately disabled UAC virtualization for the program. After ensuring the administrator elevation is not requested through shortcut settings and also the program satisfies all other UAC virtualization requirements, It was rather clear that the requestedExecutionLevel attribute was in play. In Windows XP, external manifest files had priority over embedded ones. So all we needed to do was to create a filename.exe.manifest in the same location as filename.exe, setup the correct manifest attributes and we were good to go (Of course back then there was no concept of UAC like we have today either). Ever since Windows Vista however this has changed6 and making an external manifest file does not work if there is an embedded one. This apparently can be adjusted by a registry hack7. However, please note that it would be a system wide change and is generally not advised. 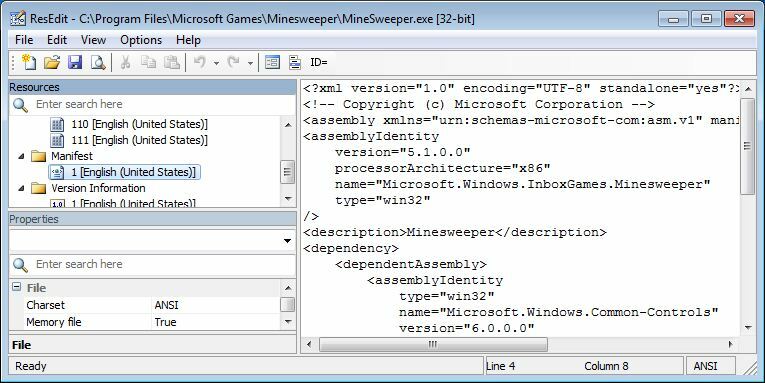 There are numerous tools available for manipulating resources (and hence its manifest) of an executable. My favorite tool used to be ResEdit, but nowadays there are now too many to choose from (including Microsoft’s own Mage/MageUI). Using resource editors on our file however, was not successful. All of them either failed to get the file’s manifest, crashed while doing so, or produced an unexecutable file afterwards. Digging a bit deeper, I do believe now that this is because of the executable being packed by ASPack. Instead of going to the process of unpacking the file first, I decided to do the dirty work myself. No matter how much the file is encrypted/compressed, there are some parts of it that can’t/shouldn’t be packed. That is so because Windows components (like Windows Shell) directly access them even before execution (remember Stuxnet? 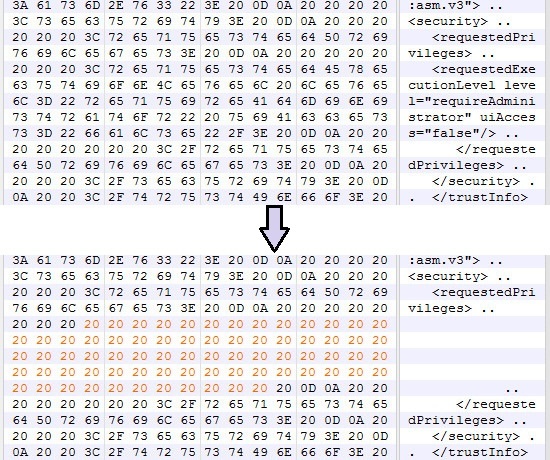 ), embedded manifest is one of those parts. Shimming is a technique for changing an application’s compatibility settings. 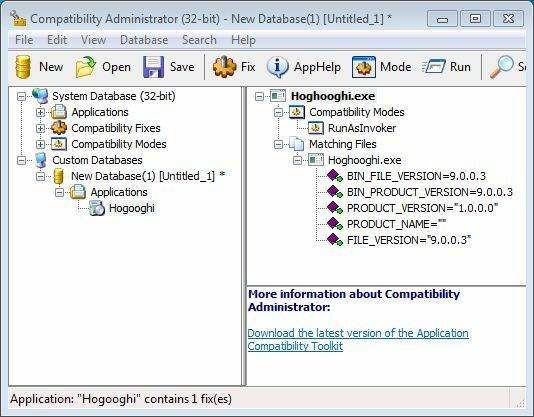 The idea is to use a tool called Application Compatibility Toolkit or ACT, to adjust Windows application compatibility settings for an executable. As you might have guessed, this is a per Windows setting and needs to be applied for each PC the application needs to be run on. But it would eliminate the need of messing with the binary (which could very well violate its EULA).